“Emotion is any conscious experience characterized by intense mental activity and a high degree of pleasure or displeasure. Scientific discourse has drifted to other meanings and there is no consensus on a definition. Emotion is often intertwined with mood, temperament, personality, disposition, and motivation” – so Wikipedia. Creating emotions and connecting emotionally is a well know concept when it comes to fundraising, but seldom it is spoken about in a broader context and reflected in the worlds of non-profit organisations. Especially when it comes to not so pleasant forms of emotions like let’s say jealousy this is the case. Hidden behind formal questions and considerations the poison of jealousy is a formidable enemy of cooperation between non-governmental organisation – jealousy regarding fundraising results or publicity is hardly spoken about but whispered behind the backs of those involved. Jealously can destroy great work done and prevent developments needed to be up to the standard needed serving the purpose of an organisation. Another emotion not often spoken about in our circles is the tension between humbleness and ego-trips and the mixture of those two – standing in the lime-light and being thanked at every occasion can be like a drug taken and not being missed any more. Being in Dresden to be part of the HOPE Gala for the 12th time I am so much aware that as the chair of an organisation like HOPE Cape Town I depend solely on the goodness of other people to be able to fulfil my role in this NGO. It humbles me – again an emotion – to see how many people dedicate time and money, prayer and good thoughts to allow me to represent and lead this organisation. Without the volunteer to drive a so-called VIP, – without the cleaners making sure that the venue is clean for the show, without the chefs preparing meals for the after show party – without those working hard behind the scene to make it happen – without all those running around – HOPE Cape Town would not be what it is. Gratefulness is the feeling here to mention, a deep gratitude to all involved. Humans are complex and so is their emotional household. We should be always aware of what it is what carries me as a person – we should always honestly assess our feelings and see what makes us tick. Honest reflection is the key. Only when we reflect with honesty we acknowledge us and others in all the complexity we live as human beings trying to serve human mankind and making this world a better place for all. Times are moving fast and arriving in Dresden attending the 11th HOPE Gala it is time to reflect on all what is happening in the world around us. In South Africa, times are getting more and more tough – students are trying to force the state into submission of free education with turmoil, violence and militant language – not seeing that their initially good cause is meanwhile compromised for many reasons. President Zuma survived another non-confidence vote as the ANC is still not ready to acknowledge the magnitude of corruption and damage done to the country. In the USA a womanizer and liar with a very limited world view is elected president via a system which assembles only a shadow of democracy. In Germany right-wing thoughts are popular again and the populist AfD seems to win the hearts and minds of more and more people. Black and white, simple solutions, believing in simple answers, following a gut feeling of fear and anxiety seems to govern most people in this global village. And the systems holding societies together are fading away in the challenges of today; the vast amount of information available at any given time seems to be so indigestible to most global village inhabitants so that they seek refuge in those mentioned simple answers. Churches seemed to be too much self-absorbed to have the time to really take note and actively work against this trend of time – when you look to the USA, most Catholic Bishops were so occupied with certain topics that the social Catholic teaching faded away in the judgements given before the elections. Well, life turns in circles and therefore there is always hope that the wheels are turning again and reason will prevail. There is no need to get lost in desperation, but this is a time to watchfully and carefully observe the situation and to actively try to correct the turns of society and their leadership into a direction towards humanity, charity, tolerance and compassion at heart. The HOPE Gala in Dresden shows me that people still care, that people still go the extra mile to assist and help and reach out to people far away; those living on the margins of the wealthy spots in our global village. 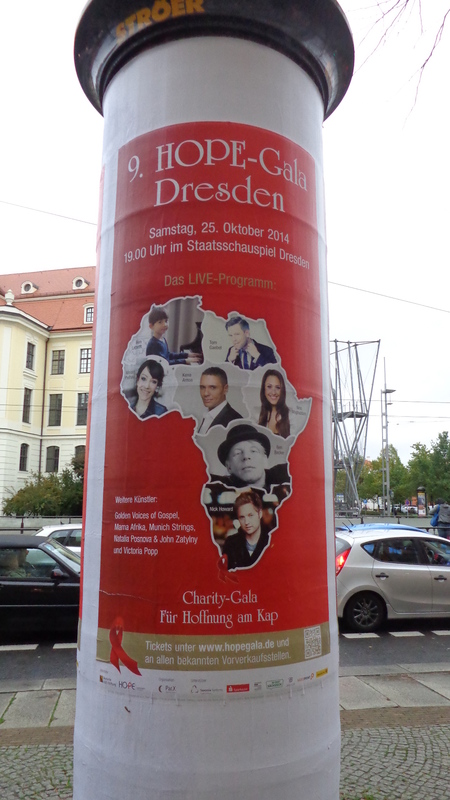 There is hope as events like this are happening not only in Dresden but also for many good causes around the globe. As long as there are some lights in the darkness of todays social and political developments, as long as there are people not giving up on trying to better all lives instead only their own ones – as long as there is resistance to let go those unfortunate living in the wrong places or born at the wrong times there is a reason to fight for a global village which is compassionate about everybody equally. I guess we also have to learn to strive a balance between information flows possible and the ability of people to digest those info. Again we have to learn that human minds and brains and hearts have a limited capacity of in-take. And that fear and anxiety are bad advisers when it comes to develop our future as a human family. As always life goes on and there is light at the end of the tunnel – faith, love and hope remain as the bible tells us rightly. 2 weeks of promoting HOPE Cape Town are coming to an end and I am sitting at Frankfurt airport waiting for my flight back home to South Africa. Time was flying as usual and sitting here and waiting gives some time to reflect on all what was happening in the last 14 days. Faces of students are crossing my mind whom I met while giving a talk in one of the more rural schools in the northern part of Germany. People, who have never seen a HIV positive person were subjected to a talk about the danger of HIV. And not only that: how to bring the South African reality of crime, corruption and toi-toi to those who never experienced anything else than the orderly running of day-to-day life. Filling the gap, this is what HOPE Cape Town is doing in the fields of HIV and AIDS when it comes to government involvement, filling the gaps applies also when bridging the well-protected realities of a student attending school in rural Germany and those living in Manenberg or Wallecedene. Press conference in Dresden in preparation of the HOPE Gala – another crowd of people, journalists, wanting to know the progress of HOPE Cape Town’s work in the Western Cape and how money is spend in a responsible way. Pre-recording for a German radio broadcaster – HOPE Cape Town’s story and some private talk included – the moderator wants to know the person behind the project including the seemingly ever hot topic of church and HIV and the famous “c” question…Bridging worlds means also knowing different people – a wedding in France was another highlight on this trip to Europe – diving into the world of stars and VIP’s and playing a small little role in the romance of two people. It’s more on the private side but also serves some networking for HOPE Cape Town on a very different scale. So from the small town student to the previous chancellor of Germany – the scale of people I met was quite amazing and so have been the interactions and chats in between. Being able to touch the lives of so different people in so many different ways – this is the beauty and the blessing of the work, I am allowed to do. And so remains gratefulness as the essence of the reflection I was able to do before Cape Town and HOPE Cape Town and all the others waiting for me demand again all my time and energy. Life is good.